The Jr./Sr. High School has a new breakfast option. 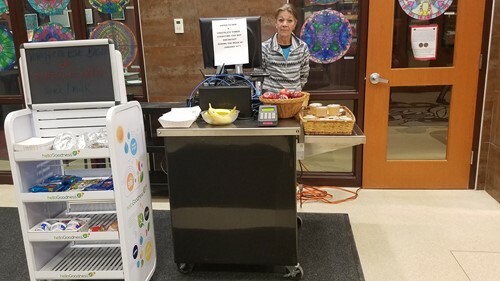 Instead of going through the traditional cafeteria line, students can now stop by the Grab & Go cart in the front foyer outside the main office. This new option allows students who may not have time to sit down and eat in the cafeteria to have a bagel or a piece of fruit to take with them. Students use their pin number just as they would in the cafeteria line. The cart is open from 7:10 to 7:45 a.m. Traditional breakfast options are still available in the cafeteria.